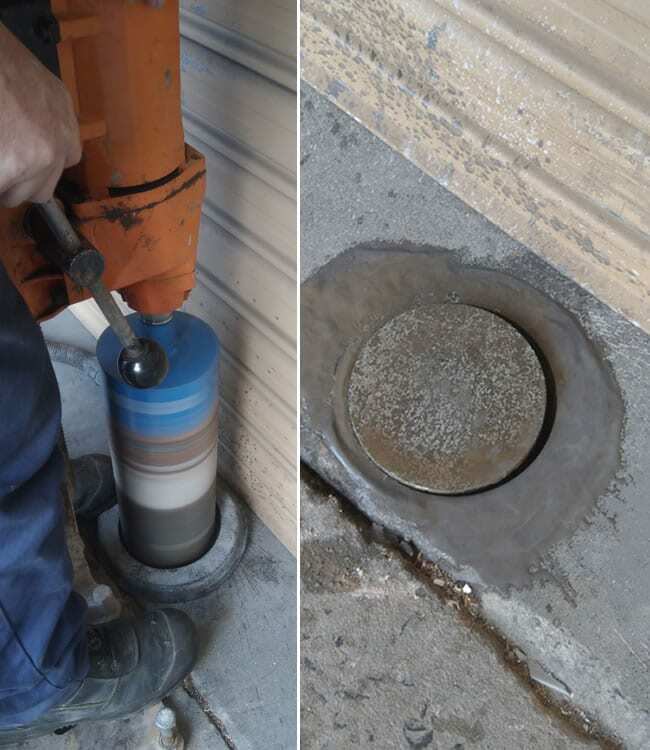 With good preparation, installing a SHUG Removable Bollard is a relatively straightforward process. It helps to have the right tools, but common sense and an eye for safety are always important. We start by carefully measuring and marking the location of the bollard. Get this wrong, and things will start badly and only get worse, so we always double check. Measure twice, cut once. We then position the core drill and level it before cutting the hole. Once the cutting is complete, we lift the core with a hammer drill to reveal a nice neat hole. We remove loose rubble from the hole and vacuum the excess water away. Next, we dig down to a depth of 300mm using a crowbar and a hole shovel. 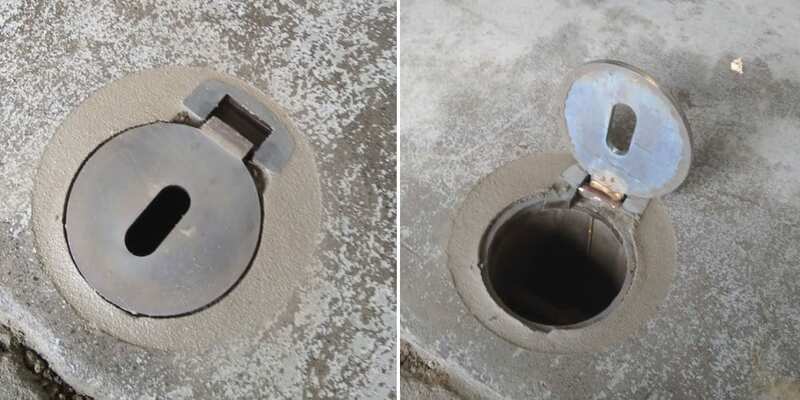 We will be placing the bollard sleeve in the hole and backfilling with concrete, so we tape up the top and bottom to keep the inside clean. As we want the top of the sleeve to be level with the ground, when we place it into the hole, it sits on a bed of dry concrete or crushed rock to bring it up to the right position. With a levelling bubble to ensure that the sleeve is perfectly upright, we add more dry concrete or rock to hold it in place. 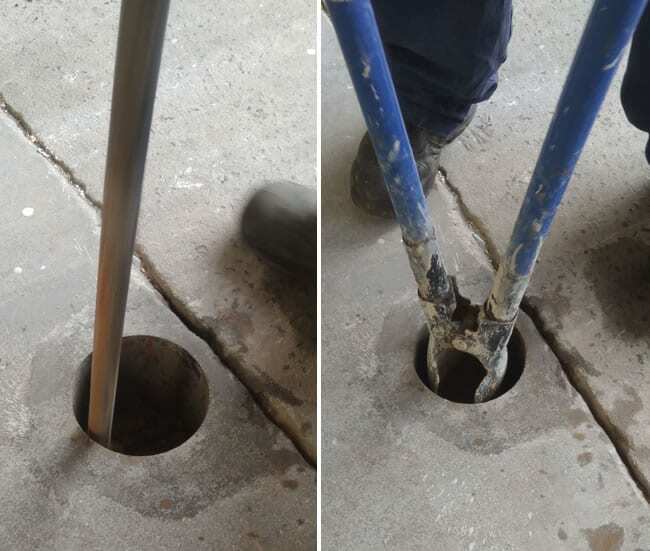 We mix a batch of wet concrete and fill the hole around the sleeve leaving a gap of 20mm at the top. Then we fill the gap with industrial grout up to ground level and leave until almost dry. When the grout is firm enough, we use a damp sponge to smooth it off to a neat finish. We remove the tape from the top of the sleeve and give the top plate a final wipe over to remove any grout or concrete left behind. 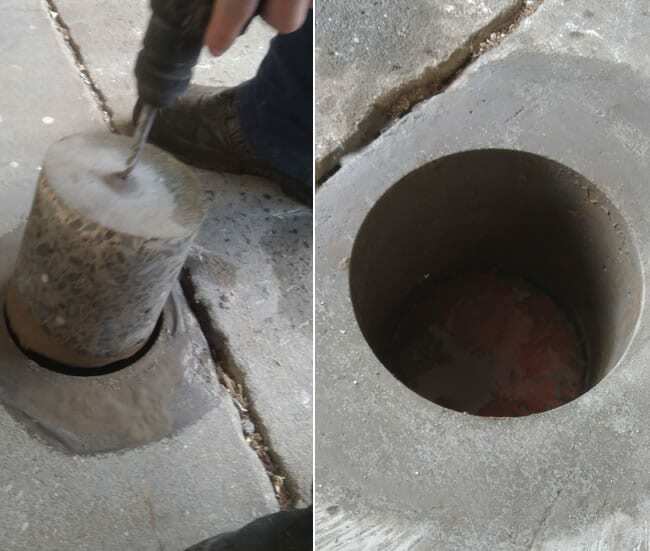 We fit the bollard body once the concrete and grout have properly set. Job done! The SHUG Removable Bollard is one example from our range of safety and security bollards. If you need a bollard solution to protect your property and the people that use it, call SHUG Bollards today. Do you need something slightly different? We specialise in bespoke solutions too and would be happy to discuss your requirements.